The M/V Our Lady of Naju was a cruiser ferry acquired by Carlos A. Gothong Lines Inc. (CAGLI) in early 1994. From afar, she looks a little small but checking her dimensions, she really is not. She was fielded by Gothong in the overnight ferry Cebu-Ozamis route to relieve the already-unreliable MV Don Benjamin which was then disposed off. 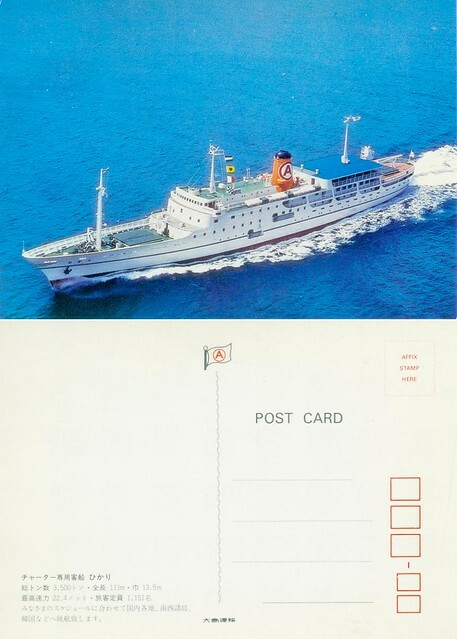 In Japan, the MV Our Lady of Naju was known as the MV Hikari. Her owner there was Oshima Unyu K.K. (“Oshima Transportation” in English). The ship was built by Mitsubishi Heavy Industries (MHI) in their Shimonoseki shipyard in 1972. She has the ID IMO 7211713. Her Length Over-all (LOA) was 111.4 meters with a Breadth of 13.9 meters (which was rather thin) and a Depth of 6.2 meters. Her original Gross Register Tonnage (GRT) was 3,123 tons which later rose to 3,500 tons. Her Japan passenger capacity was 1,151 persons and her route was to the Amami Islands, a part of the Ryukyu Archipelago chain. She was equipped with Akasaka diesel engines that gave her a total of 10,000 horsepower and a top speed of 22 knots. In 1994, the MV Hikari came to the Philippines. The refitting done to her was minimal. The scantling was extended in the bridge deck (the reason one can observe pilothouse proceedings and even the radar at the side of the bridge). A part of the cargo deck was also used for passengers. This was air-conditioned because the deck was hot). Some passengers feared that area because the waves are almost at the height of the windows. And some think that if there is an big ingress of water from the deck above in case of sinking then nobody will be able to go up the stairs. There was just a small economy section at the top deck of the ship at the stern portion. A small cargo boom was also fitted at her bow. With the renovation, the ship’s GT (Gross Tonnage) rose to 4,607 nominal tons and her NT (Net Tonnage) was declared to be 1,858 tons with the DWT (Deadweight Tonnage) being 1,196 tons. Her passenger capacity slightly rose to 1,288 persons (later as a WG&A ship this was reduced to 1,119 persons due to addition of passenger amenities). She was no longer capable of 22 knots but she still had a decent speed of 18 knots with bursts of 19 knots. However, on the Cebu-Ozamis route she needn’t do more than 17 knots. Otherwise, she would be arriving very early (those going still to Pagadian City and further appreciated her early arrival). At her fielding in 1994, she was a notch or two up compared to the other northern Mindanao-to-Cebu overnight ferries then, bar none. She was also the speediest and with the most airconditioned areas. She might have been good enough as a liner but maybe being a cruiser limited her possibilities. Anyway, being better and fast, she was much appreciated in her route. I know of some Iliganhons who would rather take a bus to Kolambugan and take the ferry there to Ozamis and sail with her rather than take the small and smelly MV Iligan City which usually carries hogs in the bow area (and that is guaranteed to bring one a hog odor upon in disembarking in Cebu even though he or she is in an airconditioned accommodation). She joined the WG&A fleet when the Great Merger happened in 1996. Not long after, she was pulled out from her original route and she was reassigned to the Manila-Dumaguit-Roxas City route which was an original route then of Aboitiz Shipping Corporation (except it has no Roxas City extension). She stayed there for about six years continuously (actually I can’t think of another route that will fit her because she is not a true liner but more of an overnight ferry). Here, she battled the old liners of Negros Navigation, the MV Don Julio and MV Don Claudio. At first they tried coaxing her to run the 249-nautical mile route to Dumaguit for just 14 hours but soon they gave up on that and allowed her progressively a 15-hour run and then a 16-hour run. Her Akasaka engines were obviously no longer up for the task of speeding then. In 2003, the end came for the MV Our Lady of Naju and that was even before the intermodal route across Tablas Strait was established (which threatened the Panay Island liners). The reason was WG&A needed to sell ships because two of the three partners were divesting (the company also sold to the breakers some cargo ships at about the same time). WG&A was then thinking of using the better MV Our Lady of Sacred Heart in the route. She was sold to China breakers along with the MV Our Lady of Banneux (the former MV SuperFerry 11) and the MV Our Lady of Akita 2 (the former MV Maynilad) which were forced to but were not successful in overnight routes. The three were broken up in Xinhui, China. Together with the MV Our Lady of Banneux (a sister ship of MV Dona Virginia), the MV Our Lady of Naju were the last cruisers of WG&A.